Tire Rotation is the physical relocation of tires to different positions in an effort to maximize the tread life on a set of tires. 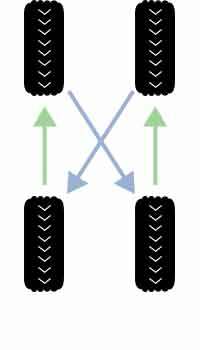 Front wheels generally wear out more quickly than rear wheels, so rotating tires from the front to the back (and vice versa) allows tires - regardless of position - to wear at a similar rate. 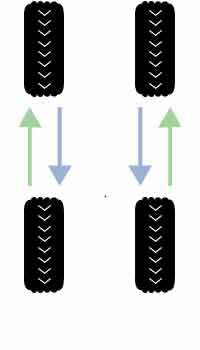 Front Wheel Drive (FWD) and Rear Wheel Drive (RWD) vehicles have different rotation recommendations, so consult a tire professional for guidance. Experts suggest that tires are rotated every 5,000 - 8000 miles for the life of the tires. Check with your tire professional to see what works best for your situation. 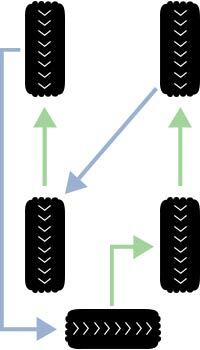 Rotation for directional tires of the same size. Rotation for rear and four-wheel-drive vehicles w/full-size matching spare.